My Kashmir Collection collides with the first, fiery embers of winter. 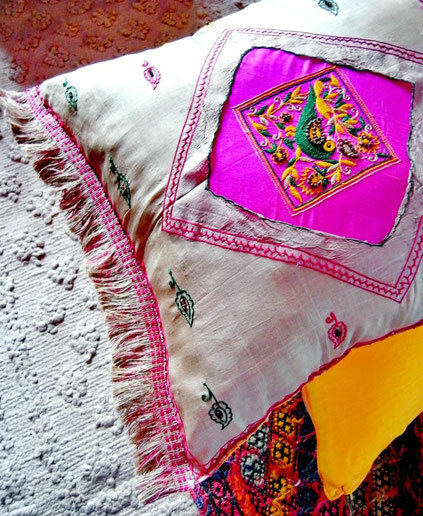 Harking back to the Northern Hills of India, wrapped in the soft, sumptuous layers of a traditional pashmina, these cushion covers communicate a tasteful, new kind of textile treatment. Designed & crafted by me, using superfine & medium weave, old & new handloom, cashmere wool SHAWLS, each piece lovingly woven/embroidered with a kaleidoscope of coloured wool, they offer a striking focal-point & rich burst of warmth to your hearth & home. 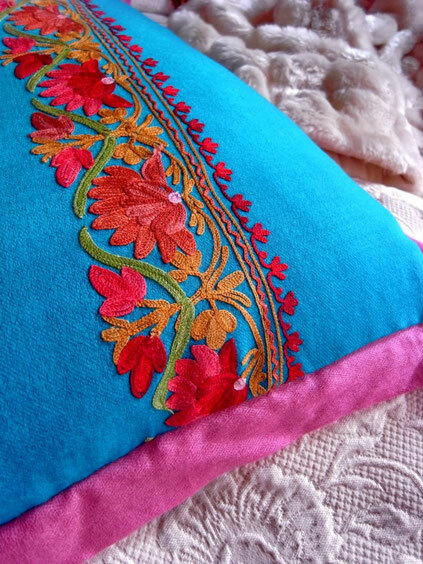 Beaded trinkets, shiny sequence & complementary coloured pashminas have been used to create a flirty trim to both offset & flatter the already cuddlesome covers. Hats off & gloves on for earthy, enduring, embraceable cashmere! EACH SHAWL HAS BEEN CUT & SECTIONED TO PRODUCE A PAIR OF MATCHING COVERS. My Sharada (Autumn) in Kolkata Collection is a tribute to botanic wanderings in the Motherland. Her flora-loving, earth, sky & sea fascinations have at once melded into cloth. Embroidered flowers & vines, glistening, reflective silks, which echo the celadon ponds & streams of the city's gardens, all come together in a celebration of the divine nature goddess. Pieces are made by me, using precious, new & used, one-off saris, off-cuts, rare, handloom fabric finds, ribbons, trims & trinkets of royal (um, bazaar) distinction. Bright & blazing, like autumn itself, set your palace afire with some wondrously woven textile warmth. My Courtly Collection of cushion covers is a sumptuous feast of alluring colours, rich fabrics, tantalising textures & carefully considered contrasts. 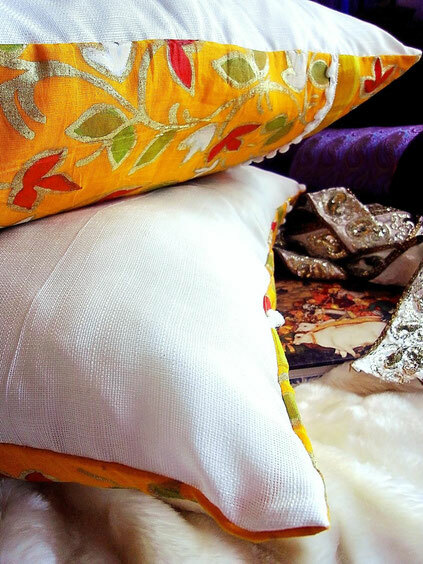 The pieces have been created, using reclaimed & reused fabrics (silks, cottons, linens, sateens) for backs & linings, & are mixed & matched to perfection with treasured handloom textiles, hand selected over the years by me. Valuable, one-of-a-kind, Indian woven silks, brocades, Central Asian embroidered cloth & block printed cottons are seamlessly paired with earthy, soft & tinseled trims to accentuate & achieve a dynamically different & luxurious decor.